With last night’s 1-0 victory over the Texas Rangers, the losingest losers are losers no more. For the first time since the Daddy Bush administration, the Pittsburgh Pirates are assured of a winning season. 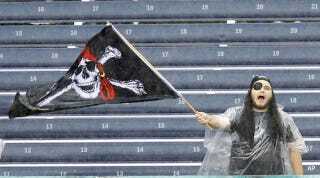 Let’s celebrate by looking back at all the crap the Buccos put their fans through during their 20-year streak of consecutive losing seasons, the longest in the history of North American professional sports. And now it’s over. Finally. At long last, proceed with the pennant race.